Birders are always trading notes about great spots to pursue their passion. Some of these are tranquil lakes; some wave-washed beaches; some windswept prairies; some leafy woodlands. All of them lovely and sweet-smelling, picture-pretty wild places. But one of the most vaunted birding sites in north Texas is an abandoned sewage plant drying bed. And a rather malodorous one at that. The birding there can be so spectacular as to get hard-core birders virtually babbling to each other. I know; I’ve been there many times. And babbled. Ducks in winter, migrating shorebirds, raptors and passerines in spring and fall, and rare water birds in summer, all in the heart of the Dallas-Fort Worth Metroplex, next to a busy six-lane street. Less than a mile northeast of Fort Worth’s sprawling Village Creek Wastewater Treatment Plant alongside Green Oaks Boulevard lie acres of former sludge drying beds. From 1970-1995, the drying beds were the final dewatering step in waste solids processing. Each summer the biosolids were removed from the beds and beneficially recycled as a fertilizer and soil conditioner on area parks, golf courses, highway easements and farmlands. 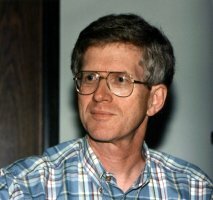 But in April, 1995, Village Creek ceased pumping sludge to the drying beds. The sludge that remained in the drying beds and adjacent stockpiles was removed under a series of contracts from 1996-2001. The drying bed site is now maintained and available as an emergency backup for sludge storage, as outlined in the City's master plan. And it has been opened, on a limited basis, to the birdwatching public. Because a unique feature of the Village Creek sludge drying beds is an incredible abundance of birds and other animals, attracted to the area over the years by the nutrient-filled water teeming with organic life. Due to the availability of water and the sheltered structure of the site, the area is also a resting stop for hundreds of migratory birds on the Central Flyway of the United States. The 240-acre site includes 45 two-acre ponds surrounded by a high levee (to keep out floodwaters from the adjacent Trinity River), plus some swampy woodland and damp meadows just outside the levee. The beds are immediately adjacent to, and bordered on three sides by, Arlington’s 1,000-acres-plus River Legacy Parks greenbelt area. Most of the park area is dense riparian woodland dotted with small meadows. Not far away is a chain of shallow lakes left from decades of sand and gravel extraction. Miles of paved and unpaved hiking and biking trails run the length of the parklands, providing access to a seemingly endless succession of other excellent birding areas along the river banks. But the drying beds are the crown jewel because of the exceedingly rich variety of birdlife to be seen there. 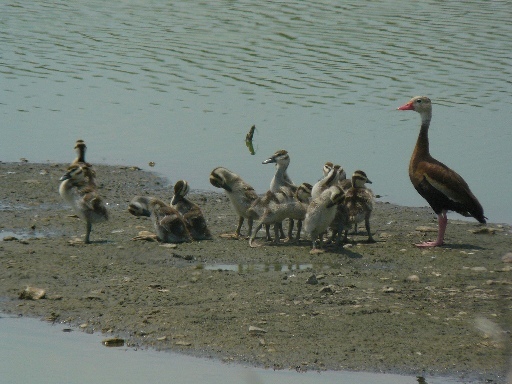 Black-bellied Whistling Tree Duck – remarkably colorful and rare hole-nesting duck usually seen only in areas close to Mexico, but often numerous here. Ibis – very Egyptian-looking wading bird with a down-curved beak. Both the white and glossy versions are seen here. 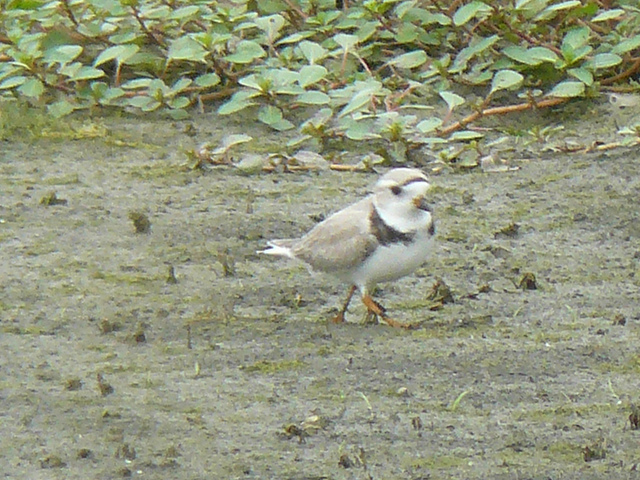 Piping Plover – pale shorebird with a distinctive black-ringed neck, these run along the pool edges, looking for food on the damp mud. Roseate Spoonbill – spectacularly beautiful bright pink wading birds with a unique flattened bill used for filtering tiny food animals from muddy water. These drying beds in Arlington must be about the only place in north Texas where these birds have been regularly sighted. Black Tern – rare and declining species of graceful bird that dives from the air to grab fish from the water. Freshwater marshes such as these are critical to their continuing survival. 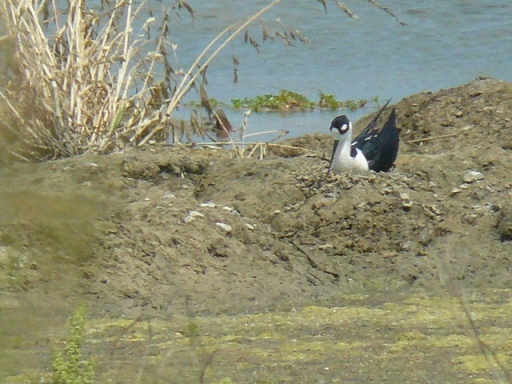 Black-necked Stilt – very slender-beaked wading bird with incredibly long and delicate legs, these feed in shallow ponds and flooded fields, stepping gingerly along as they probe for prey. Peregrine Falcon – associated with city skyscrapers and rocky cliffs, these handsome raptors also fancy open woodlands such as the park adjacent to the drying beds and are often seen there, attracted by the plentiful prey of small birds and animals so numerous in the area. Prothonotary Warbler – a marvelously bright yellow and orange migratory warbler named because its plumage supposedly reminded early Spanish explorers of the garb worn by medieval ecclesiastical court clerks. Loves swamps and shallow waterways. Yellow-headed Blackbird – a primarily western United States relative of the familiar Red-winged Blackbird, this species is rarely seen in Texas east of the trans-Pecos area, but has been spotted at the drying beds. Least Bittern – secretive and retiring wading bird that is especially attracted to the interior of cattail marshes, creeping among the stems and elevating its neck to blend into the background of reeds when threatened. From the Fielder Road exit on IH 30 in Arlington, go north on Fielder for 1.3 miles to Green Oaks Blvd. Turn right on Green Oaks and go 0.3 miles to the entrance on the left – double iron swinging gates between brick pillars. Gates open to public 7:30-4:00 most days. Follow the long entrance drive past a marsh on the left and over the boundary levee to a central parking area from which gravel drives radiate. DO NOT drive beyond barricades, though the entire area is accessible on foot. Not open during inclement weather and usually closed for a short time after rains to allow the roads to dry out. Closed by 4:30. Do not overstay or you will spend the night (or have to abandon your car and walk out). There are no shelters, drinking water, or restrooms, so come prepared in more than one sense. Bring binoculars or other optical aids, birding manuals, and a sense of wonder. You will likely not be disappointed. And after the gates close, be sure to stop by River Legacy Parks next door for more great birding. (See photo bottom of page.) Among the many species sighted in this vast and semi-wild park by avid local birders, it’s said even wood storks have been seen. Owls and woodpeckers are commonplace. As a bonus, you may see one of the park’s resident bobcats. And alligators in the Trinity are not unheard-of, a twelve-footer having been reported nearby a few years ago. 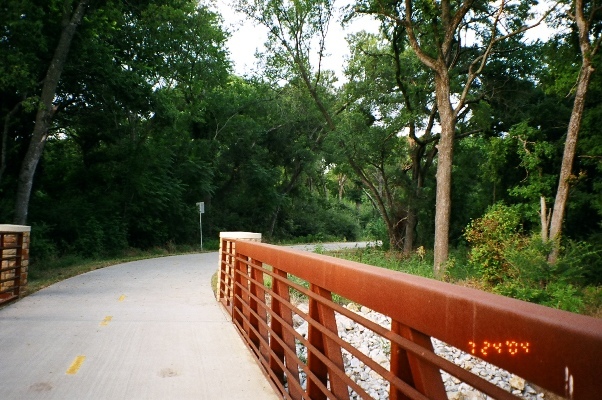 Photo below shows a tiny portion of the main trail through River Legacy Parks.